Although it’s hard to imagine winter will soon be over, since it’s only just begun, spring lawn care season is just around the corner. Winter is the perfect time to hunker down and get a head start on planning your spring landscape design. After all, there’s no better way to beat cabin fever than to stay busy and dream of warmer weather! When planning your landscape design process, it’s important to identify your aesthetic and functional needs. Landscape design does more than just beautify your property; it serves a purpose as well. For example, did you know that trees can reduce unwanted noise by up to 50 percent? In addition, professional landscaping can not only reduce your home’s heating and cooling bills, but it can also add value to your home. Perhaps you’d like to include eco-friendly, sustainable aspects to your design such as rainwater collection bins or a dry spring, or you’d like to incorporate elements of permaculture such as an edible forest garden center. Have fun finding inspiration throughout the landscape design process! Last but not least, it’s important to find landscape designers or architects who are able to bring your creative vision to life. If you have a specific idea in mind or a special request, contact us! Our 5-step process ensures the client’s voice is heard every step of the way. The most efficient and cost-effective way to spruce up your curb appeal could be a spring cleanup. 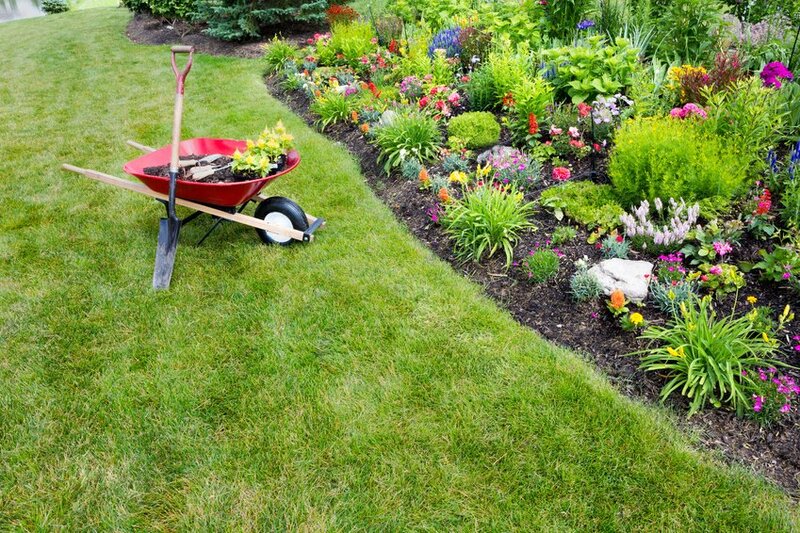 It is labor intensive, but a spring cleanup can add sparkle to a previously dull landscape. A spring cleanup usually requires a step-by-step process that needs to be mapped out work begins. First, we work in the beds, cutting back dead wood, pruning and trimming shrubs as needed, clearing out the leaves and debris left over the winter. After this, we loosen the existing mulch with a soft rake. You may want us to apply a pre-emergent herbicide in the beds to minimize future weed growth. After we haul the debris away (or compost the debris), we cut a sharp edge to the planting beds with a spade. This helps define the bed. Next, we clear out the grass and dirt disturbed by the edging, and make sure that the edge of your bed remains defined. If you want, we can fertilize the plants with Hollytone or another accepted product, making sure to follow the directions on the bag, and making sure no fertilizer makes its way to the lawn. Finally, we add mulch the to the plant beds to a standard 2-inch depth. These details, along with mowing, dethatching, overseeding and ongoing maintenance need to be decided before spring is upon us. You may as well start thinking about it now. Give us a call if you want to talk it over! Before we start on the spring’s garden care, we take inventory of the soil condition, as well as drainage and existing vegetation. We also discuss if you want new plants and what kind, to determine their placement, as different plant species require varying degrees of sunlight and water. We often find it helpful to create a basic sketch of where you’d like to place different elements of your garden. Outside of new planting, we also try to plan for weeds. Weeds can be a nuisance; however, it’s important to develop a weed management plan that is both safe and effective. If you’re striving for an organic garden, we stay away from chemical pesticides such as Ready Round Up and others. These may not be safe for consumption. By planting native species which encourage biodiversity, you may find that you’ll need to weed less. Do any of these spring lawn care plans sound like something you’ll want come April? We can start planning today! Just contact us.